THE PICKIEST EATER IN THE WORLD: YEEHAAWW!!! WE'RE AT TEXAS ROADHOUSE GRILL! My Therapist says I should stop hiding my feelings and learn how to express myself more. I've had my eye on Texas Roadhouse Grill for quite some time now, but i've never actually had the time to check it out. When they opened a branch in El Pueblo three years ago, I was living in Mega Plaza in Ortigas, which is just a few blocks down, but I still wasn't able to go try it out. Mainly because I saw the flyer and the prices seemed to be a little steep, although I had to admit, the menu was pretty much up my alley. I had totally forgotten about the place until a couple of months back, a friend from work said that their Philly Cheese Steak was one of the best he had ever tried. I did a little research for some dishes that I thought I'd like, and had resolved to go check the place out soon. The name alone, Texas Roadhouse Grill" has got "RichieZ" all over it so i felt I couldn't be carry the Pickiest Eater name without trying this place. When Rina asked if we could take our Shih Tzu puppy Schatzi to High Street, I figured that would be the best chance for us to try it. When you walk in to Texas Roadhouse Grill, you instantly feel like you just walked on the set of a Western Movie. Looking around, I was half expecting Doc Brown to barge in telling Marty Mcfly they could fire up the Flux Capacitor by having a train push their DeLorean so they can get back to 1985. 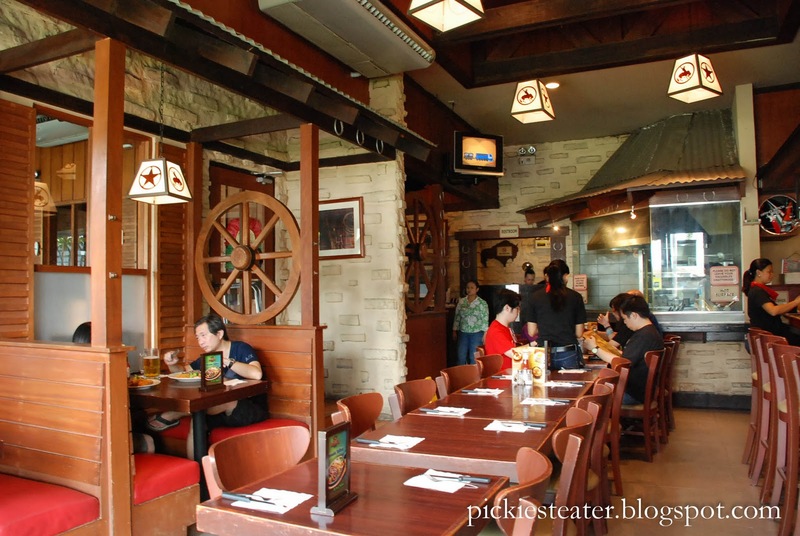 (I don't watch many Westerns so the only one I could think of is "Back To The Future III") Wooden interiors, and a lot of wagon wheels around the place help complete the Cowboy look. Since Schatzi was with us, Rina and I sat outside, so I can't really a good assessment of what the ambiance was like inside. Although I can say that staying outside was quite refreshing. It was a beautiful sunny day, but the strategically placed electric fans were sufficient enough to keep us from dying from the humidity. And despite the fact that we sat outside, the waiters were very attentive, with at least one stationed by the door at all times. We took a look at the Menu at what we wanted to order, and as usual, I couldn't settle on what I wanted to order. But I did distinctly remember that I found the steaks a bit too expensive. The Parmesan Crusted Fish Fillet also caught my attention, but I remembered that we were in a restaurant that had the word "Grill" in it's name, so maybe it would be best to see if they rise to the challenge of their claim. 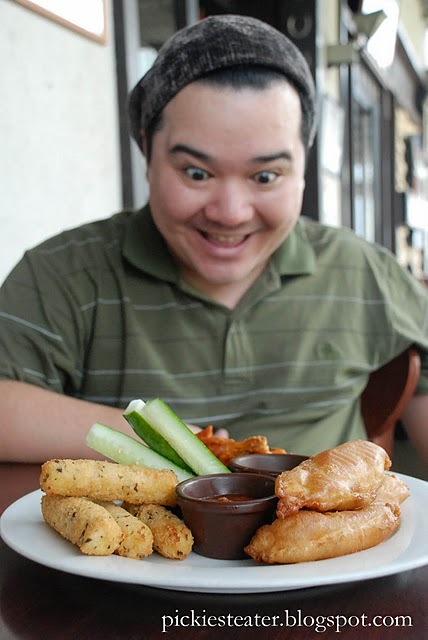 I couldn't decide on what Appetizer to get, so it made sense to order the Jessie James Sampler (P395), which consisted of Wild Cheese Fritters, Chicken Tenders, and Buffalo wings - which we were happy with, despite it being more expensive than the main courses we ordered. The Chicken Tenders were really good, but tasted too much like Chili's Chicken Crispers for me. But don't get me wrong - I love the Chicken Crispers of Chili's, but we're at Texas Roadhouse Grill for god's sake. It should have it's own unique taste. Even the honey mustard sauce tasted very familiar. The only difference was, when you dip the chicken into the mustard sauce, it's quite likely the then breading would peel off and it would end up being left in the sauce bowl. Something that doesn't happen to the Chili's version. Nevertheless, it was still quite delicious - but for you health nuts out there, its also as oily as the ones from Chili's. The mozzarella sticks were crispy on the outside, while the cheese was soft and gooey on the inside, without creating much of a mess. If you're looking for a stronger flavor from the cheese, you can always dip it in the marinara sauce (or in my case, the honey mustard sauce). 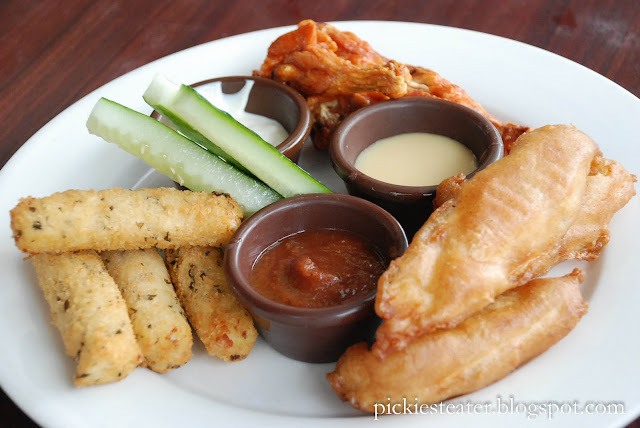 I don't usually like Buffalo wings, but TRG (yezz.. close) has one of the best ones I've tried. I usually find them too vinegary for my taste, and the smell of the blue cheese dip makes me wanna hurl. (Is it too much to ask for a dip made from cheese that isn't rotten?) This one still had that citric taste to it, but balanced in such a way that the flavor of the actual chicken wasn't overpowered. 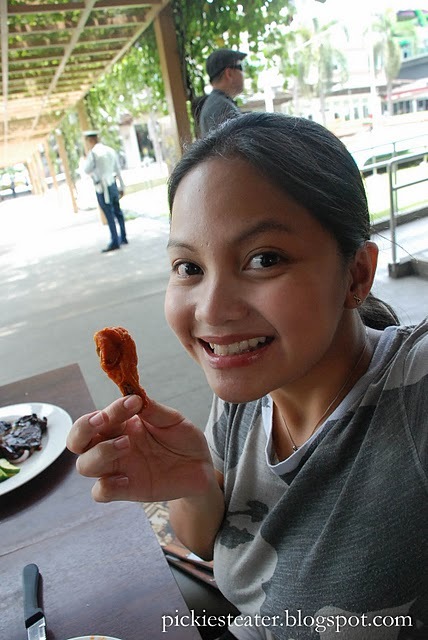 Rina really loved the wings! In fact, after taking one bite of it, she suddenly (and might I say, suspiciously) remembered that I'm hyper-acidic, and therefore I shouldn't eat too much of it. (What a dutiful wife she is, huh?) As expected, she did the honors of finishing it off. Much to my surprise, TRG's line up of steaks sounded a little weak. Of course you have the "The Great Ribeye" that goes for P1,295.00, but after that, all they have are flat iron steaks, and blade steaks, which are usually leaner than your more traditional cuts of meat. What's wrong with a good old fashioned fatty Porterhouse or T-Bone? Didn't cowboys use to eat that back in the day? Apart from that, the menu was pretty much standard fare. Ribs, Chops, Burgers and pasta entrees that won't exactly win TRG any points in creativity. But this wasn't an art class so at the end of the day, as long as the food on the menu was good, I was willing to eat whatever was on it. I ordered the Boneless BBQ Chicken (P330), because it was branded with a star on the Menu, meaning it was one of The "Sheriff's Favorites". Who that Sheriff might be, I have no clue, but it was so good, It could've been the evil sheriff of Nottingham and I still would've given him a high five. Based on appearances alone, the Chicken looked masterfully grilled. The skin had nice char marks on it and a beautiful shiny glaze, yet the meat was still immaculately white. The dish was packed with flavor, with the sauce using a sweet base to it that i tend to prefer (especially over the hickory based variants). The Texas rice though, didn't leave much an impact on me. I didn't get what was so "Texas" about it. Sure it was yellow and had pimientos mixed into it, but they might as well have used garlic rice. Oh and the siding of Fresh Veggies was like a salad in itself. (What a serious waste of plate space) The only difference though, I don't think it was even buttered or anything like that. Just chopped up veggies (and maybe a little salt), and thrown on a plate (Again, I reiterate, mashed potatoes are the perfect sides for ANY dish). I'm guessing that the veggies and the rice were brought together to give some color to what otherwise might have been dull plating. Cuz visually, it does look like a vibrant dish, despite the fact that the star of it is practically black already. Regardless, the chicken was good, so that's all that mattered. Pork & Cheese. Match made in heaven. 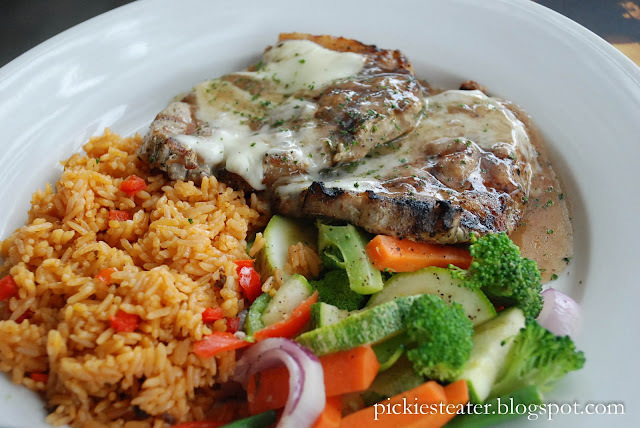 The moment I saw the Wrangler's Pork Steak (P360) on their menu, i just knew that this was what Rina was going to order. Once again, it was a dish slathered in cheese. Not just any run of the mill cheese, mind you, but Swiss Cheese, Nonetheless. And once again, I was right on the money. I've got to hand it to Texas Roadhouse Grill, though. These people know how to grill up a piece of meat. The two medium pieces of pork steaks were done superbly. The meat was still incredibly tender, and the smokey grilled taste swarmed into your mouth with every bite. The quantity of the cheese wasn't exactly as much as the picture on the menu suggested, but with the au jus of the steak, it wasn't really all that necessary anymore. The rich flavor of the cheese and the light meaty touch of the au jus created a wonderful tag team that would've made the Legion of Doom proud. Again, my old comment would be about the side orders. In all honesty though, between the chicken and the sampler plate, Rina and I were so stuffed we didn't even touch the second pork steak anymore, (which is fine because she had it for lunch the next day) and we sure didn't have room for dessert (especially since we were going to two more places that day, Last Wednesday's Krispy Kreme post and another that will be posted in a couple of weeks). Although I must admit, I was intrigued by the Apple Crumble, and Rina's ears rang after she read that the Mighty Oreo Mud Pie had not just crushed Oreos on it, but bits of Snickers pieces too! 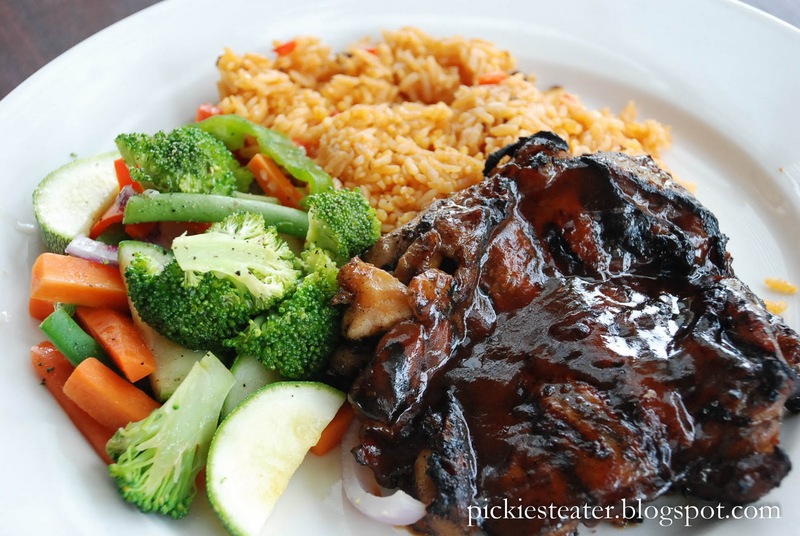 I can't decide if I'll get the boneless BBQ chicken or the pork steak, both look so good! I bet that Philly cheese steak will be awesome too. Waaa decisions. Haven't tried Buffalo's Wings N' Things.. but i'll keep it in mind.. I'm pretty sure Rina will wanna try it.. we also got suggestions for Wing Man as well hehe.. If you think reading it on an empty stomach is hard, you can't imagine what it's like for me WRITING it on an empty stomach!